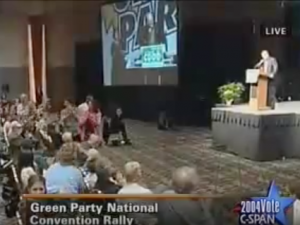 The general charge of the Credentials Committee is to facilitate the credentialing of delegates to the Presidential Nominating Convention of the Green Party of the United States. The Credentials Committee is governed by the Rules, Policies & Procedures of the Credentials Committee, as approved by the National Committee through the adoption of Proposal #330. The general charge of the Credentials Committee is specifically defined in Article I, Section 1-2. The Presidential Nominating Convention Delegate Credentials process is governed by Article IV Credentialing of Delegates of the Rules of the Presidential Nominating Convention of the Green Party of the United States, as approved by the National Committee through the adoption of Proposal #345. The Credentials Committee was first created in November 2003 through approval of Proposal #55. The Credentials Process for the 2004 Presidential Nominating Convention was governed by Proposals #55, #98 and #107, as approved by the National Commitee. The Credentials Process approved for 2004 was designed to sunset after the 2004 Convention. The Credentials Process approved in Proposal #330 in 2008 was designed to apply in 2008 and beyond, subject to future amendment by the National Committee.